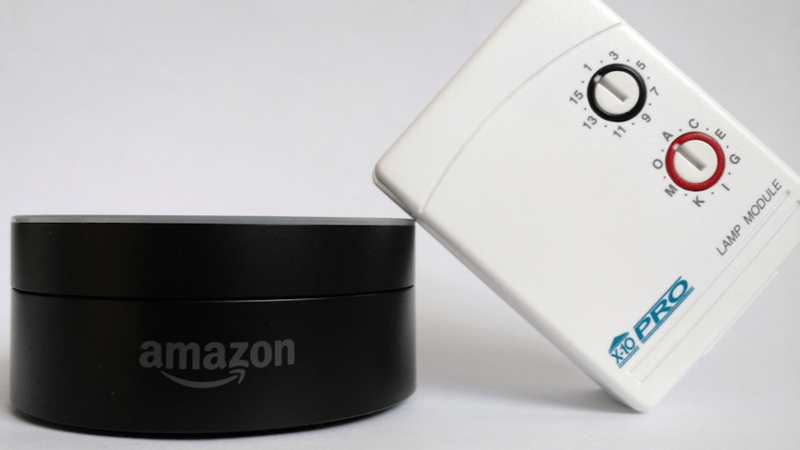 In a previous post you’ve learned how to control your X10 devices using the Amazon Echo and the IFTTT service. But now Amazon allows you to code a Smart Home Skill so you can say Alexa turn on the lights instead of Alexa trigger lights on. It’s more convenient! Let’s extend the work we’ve already done to write a Smart Home Skill to natively manage your X10 devices. You have to do everything in this post completely except for the IFTTT part (the last section). An Amazon Developer account. It’s free. An Amazon AWS account, because we need the Lambda Service. It’ll be free if you use your skill less than 1 million times a month, which is a lot. This is a requirement, not optional. An Amazon Login account, completely free, to authenticate your skill. Discovery: This is the procedure that will be called when you say Alexa discover my devices. It should tell your web server to read the INI file and return a JSON string with all the devices you have configured. Control: This is the main procedure to turn on/off things or to dim/brighten lights. You already implemented the Control interface in the previous post, but you need to create an interface on your web server to do the discovery. You have to change echo.echoparklake.com with the domain name of your web server, of course. For now we are not going to go any further. We’ll go back to this when we have everything else. Now you need to create an AWS account. After you have created your account and have logged in, click on AWS and select Lambda under the Compute section. Click on Next. Choose a name for your Lambda function, and a description. The runtime should be Node.js 4.3. Click on Next and then Create Function. After that look at the top right of your screen and take note of the ARN it should be something like arn:aws:lambda:us-east-1:239411752002:function:myX10LambdaFunction. You will need it later. We need an Amazon Login account to be able to use OAuth authentication for the skill. After you create your account and are logged in, click on the Register New Application button. Now click on Web Settings. Take a note of the Client ID, we’ll need it later. Now we must go back to the Amazon Developer Console and edit our Smart Home Skill. Go to Configuration and in the Endpoint section, click on North America (assuming you created your Lambda function there) and paste the ARN of your Lambda function there. The Authorization URL should be https://www.amazon.com/ap/oa since we are using the Amazon Login service. Paste the Client ID from your Amazon Login application you just created in the previous step in the Client ID field. Add your domain in the Domain List field. For instance, we would have to use echoparklake.com since that’s the domain we’ve been using as an example. In your case just type the domain name you have been using. In the Scope field, type profile. Select Auth Code Grant in the Authorization Grant Type field. The Access Token URI should be https://api.amazon.com/auth/o2/token. Paste the Client Secret from your Amazon Login application to the Client Secret field. The Client Authentication Scheme should be HTTP Basic Authentication. 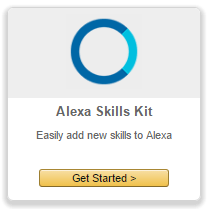 Click on Next and then enable it in the Test section so you can see the skill in the Alexa app. Go to the Alexa app (do it from a PC browser, not from your phone or tablet) and look for your skill in the Your Skills section and click on Enable. It should go to the Amazon Login website to ask for your login and password if you are not already logged in (you should be, though). After that, the Alexa app should ask you to discover devices. You can also discover them by saying Alexa discover my devices. If everything went well you should see a list of all the devices you configured in your INI file. Now you can try to turn them on or off, for example saying Alexa turn on the lights. This entry was posted in Amazon Alexa and tagged alexa skills, x10. Bookmark the permalink. ← Tired of Windows cmd.exe? ConEmu is exactly what you need! Thanks for the update. I’ve done all the steps, and I think I’m pretty close to having it working. A couple things… I discovered that when configuring triggers you can only find the Alexa Smart Home trigger if you’re using the US East (N. Virginia) region. Also, is there an easy way to debug errors? I’m pretty sure I have everything configured right, but CloudWatch shows me invocation errors for the lambda function, and I can see from my web server logs that discover.php is not running when the function executes. I can view it myself, and the output looks fine. I’m thinking it might be the lambda function timing out because DNS isn’t resolving my server. I only created the subdomain today, and while it resolves locally with my ISP, I tried from a couple of other machines (work, etc.) and it timed out with no response. I guess I just have to wait. Sorry for the spam. My ISP was blocking the incoming port. All is well now! Now I’m lost 🙂 Is it working? It’s a nightmare to debug since there’s a lot of components, but the Lambda Function section has a Test with several Alexa Smart Home Skill templates and also you can turn on CloudWatch. Also the first thing you have to be sure is that all your PHP scripts work by manually calling the URLs and looking at the JSON results and the log of your web server. Haha, sorry… Yes, everything works as you described, except you might want to remind readers to select US East (N. Virginia) before trying to configure the triggers. I was having trouble debugging the script. CloudWatch showed me there were errors each time the lambda script was invoked, but the logs were pretty useless. I initially thought my problem was that DNS hadn’t propagated, so the hostname wasn’t resolving. That assumption was false. The problem was actually that my ISP blocks incoming requests on port 80. So I changed my virtual server / NAT config to use a different port that wasn’t blocked, and then I modified the lambda script to use that port instead of 80. Anyway, all is well now. I am able to control my lights with Alexa. And I appreciate your articles and your helpful responses. Thanks! You will find this option in a drop-down, on the “Configure Triggers” page. It is located in the upper right-hand corner, in between your account name & support drop-downs. ARRRGH! First, thanks for sharing your work! I successfully went through the first post fine. I’m able to control devices with IFTTT (I did go through all of the steps if that’s a problem). I’m able to reach my comparable http://echo.echoparklake.com/ifttt/discover.php in a browser (although the appearance of the response differs – mine is basically rows rather than a coded outline would appear). I followed through the Amazon steps and can’t figure out where I’m going wrong. I’ve tried deleting and recreating the Lambda function as well. I’ve noticed a couple things and hope you can help. First, my domain is echo.echopark.lake to your echo.echoparklake (i.e. with a period in the middle). When creating the lambda function, the only choice for role is service-role/lambda_basic_execution, rather than just lambda_basic_execution. I’m able to see my skill in Alexa (from by PC and ios device) and it prompts me for the Amazon password and says I’m linked. Although it doesn’t give me any error, in the metrics tab of “login with Amazon”, it shows 0 sign-in success and 0 consent granted. After deleting the first function and creating a second one from scratch, I’m only able to see graphs of CloudWatch metrics, but when I click to View logs in CloudWatch, I only see graphs and can’t read logs anymore. Under log groups, it says nothing is subscribed. (as best I recall, the logs of my first attempt mentioned something about “someaccesstoken” and maybe bad syntax). Invocation counts and invocation errors are identical. Sorry to be so long winded, but would greatly appreciate any help getting across the finish line. If there is more information I can provide, please let me know. When you say “Alexa discover my devices” do you actually see the attempt in your Apache logs? Because if you do see it, then there must be something in your discover.php that makes a wrong JSON response or something, or maybe some parameter is missing. Now if you don’t even see anything in your Apache log (that is the Alexa service can’t contact your server) must be something else. I’m not sure reading your logs if those are actually attemps of discovery or you pressing the Test button for the Lambda Service. I can see those are Amazon IPs, but not sure doing what. It’s pretty easy to solve if Alexa actually contact your Apache Web Server when you ask the Echo to discover your devices. If that’s the case just show me the JSON and I will tell you what’s wrong with it. Well, then I think this might be good news. Just asked alexa (on my tap) to discover my devices twice. Two additiional entries went into the log. So, here’s the discovery.php — JSON. That one looks good, but maybe there’s some kind of syntax error or an invalid character in any of your devices. Why don’t you try with just one single device in your INI file and try to discover that one? If that works, then try to add one more each time to see if you can catch which one is failing. Unfortunately, no new devices were found. Any other thoughts? I pasted it in. It says at the top of the screen: “There is an error in your JSON event. Please correct it before saving.” The save and test buttons are greyed out, so continuing isn’t a choice. The 2 in payloadversion statement is in red. Oh well this blog changed all the double quotes to stylized ones and you can’t paste it from here. You have to replace all double quotes with new ones, not stylized, to make them work. Sorry, should have known to run it through an editor. Your Lambda function fails in the JSON.parse() (line 64 right?). That’s when it is trying to parse the JSON from your server. It says it has a “<" in the response, making your JSON invalid. You have to see carefully what your PHP is responding. Looks like your web server is sending the PHP file without executing it and then the JSON parse fails in the " < ?php " line because it is not a correct JSON response. Use a sniffer like tshark or tcpdump to see it exactly what your Web Server is sending back to Amazon, but that's where the problem is. Oh my gosh! Thanks so much for your help and patience. Embarrassing, but I’ll admit to someone following me into this screw up, it was this operator’s error the whole way. I had an HTML tag at the end of discovery.php. It wasn’t a problem viewing in a browser, but it obviously made everything else fail. Alexa just found my devices! Thanks so much! I’m glad I could help!!! You’ll see how convenient it is now without using IFTTT and natively speaking to the Echo to control your X10 devices. I never got to program the dim and bright functions, because I never use them, but eventually I will update this post links (Lambda function and discover.php) to support those actions. It’s pretty easy to do actually. I can access the discover.php page via a browser and it is resolving the items in x10.ini. Access the discover.php via browser and then select on “View Source” on your browser and read it to see if you see anything weird. If it says “Unexpected token <" it is because there's a '<' somewhere that shouldn't be there. Well, I couldn’t find an extra < in the file. I ended up whacking the build and starting over. Got it working now, thanks again for your write up and assistance! Can you assist me? I get a timeout after 10 seconds. It is the discovery of the devices.. No connection to my server is established. I tried http and https. Specified in the domain list with and without subdomain, everywhere the same behavior. You have to test it from the Lambda Skill Test window to see what’s going on. See my previous comments about how to configure a test event for a discovery. The Lambda code no longer works because it is Version 2 Payload and AWS no longer allows you to create code using that version. Has anyone updated their code to support Alexa V3 messages? I’m clueless for what needs to be done as I am not a programmer, I just follow instructions. Do you think what you read was useful and it helped you? Please consider a donation. Tired of Windows cmd.exe? ConEmu is exactly what you need!